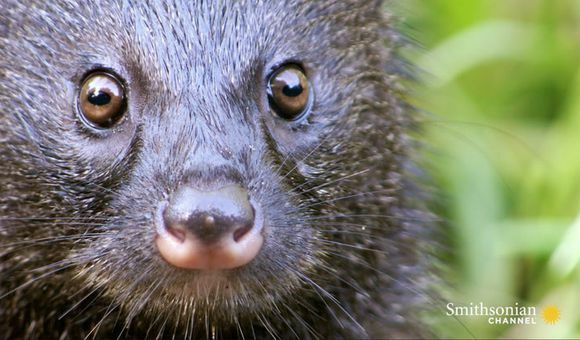 What is North America’s Most Mysterious Bird? On a hot, dry July evening, a dentist named Mike Hurtado leads two biologists into a narrow, windy stretch of the St. Charles River canyon in southern Colorado. Hurtado grew up hiking around here, and he and his family still refer to this part of the canyon reverentially as “The Place.” Its high granite walls usually echo with the sound of falling water, but the river is at the lowest point Hurtado can remember, and its waterfalls have turned to mere trickles. 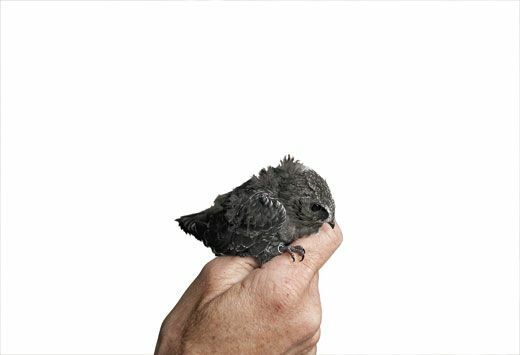 He and the biologists hope to catch a black swift, and the conditions don’t look promising. 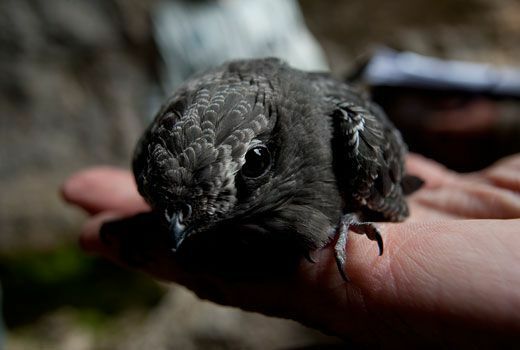 Black swifts, Cypseloides niger, are among the most enigmatic birds in North America. 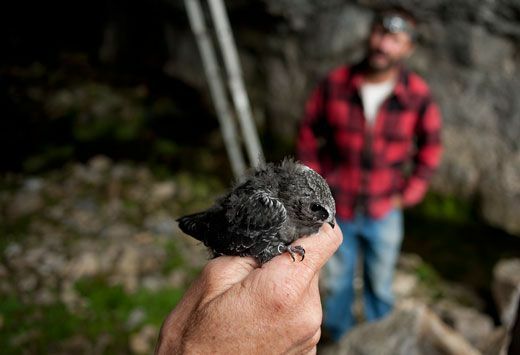 Though the species has a huge range, breeding as far south as Honduras and as far north as Alaska, the birds’ preference for nesting on steep, wet, cold rock faces—ideally behind waterfalls—means that students of black swifts need sure feet, steady nerves and an almost obsessive sense of mission. 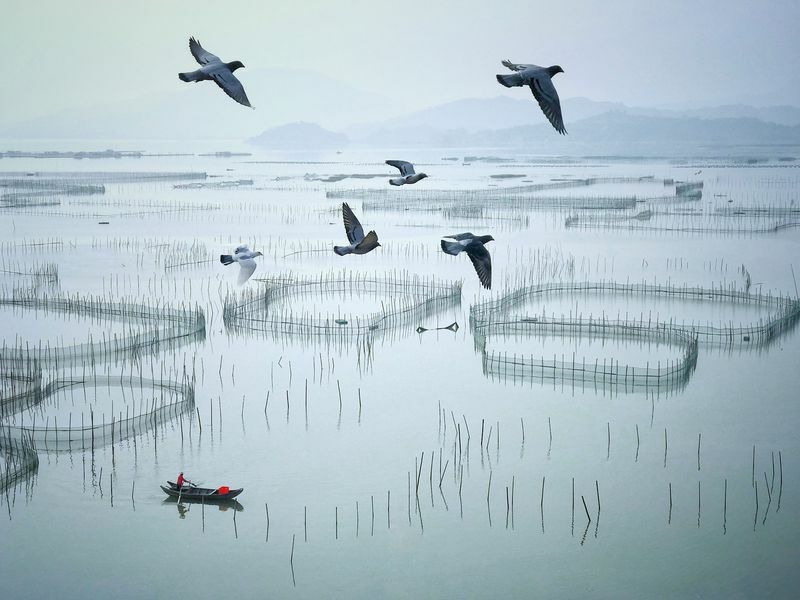 The birds’ love of forbidding places also means that no one knows if the species is increasing or decreasing, or exactly what the birds need to survive and reproduce. 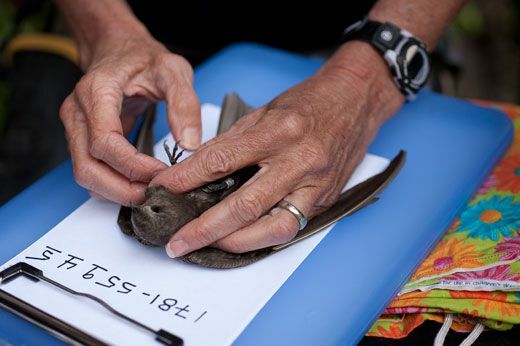 With the help of amateur bird-watchers like Hurtado, biologists in Colorado and elsewhere have begun a multiyear search for black swifts, hoping to solve these mysteries. 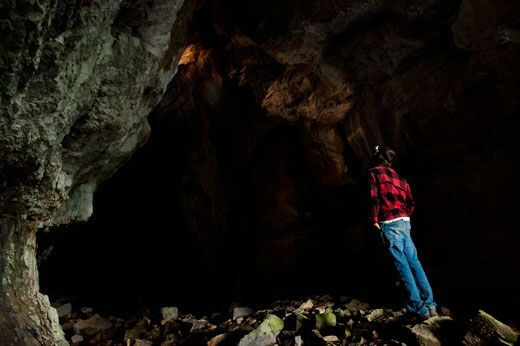 As the light starts to fade, Hurtado and his two companions, Rocky Mountain Bird Observatory ornithologist Jason Beason and U.S. Forest Service biologist Ron Torretta, reach a black swift nest site, a shallow cave in a dark rock wall. Since 2009, Beason and his colleagues have fit a few birds with geolocators—vitamin-size devices that record sunrise time and day length, data that can be used to calculate a bird’s location within about 100 miles. 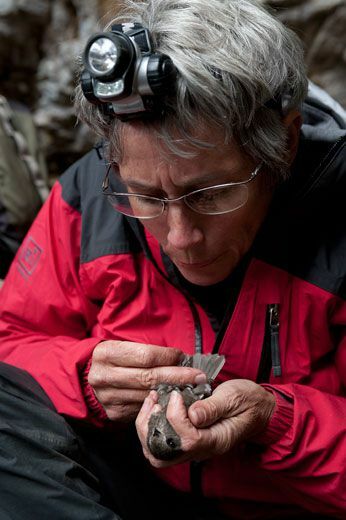 The year before, Beason had attached a geolocator to a female bird from this cave. Black swifts are known to return to the same nesting sites season after season, and tonight Beason hopes to recapture both the bird and her data-filled geolocator. 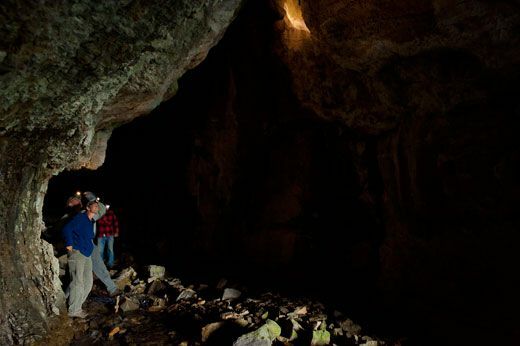 Beason and Torretta grab butterfly nets and pick their way through the triangular entrance to the cave, turning their headlamps toward the back wall. 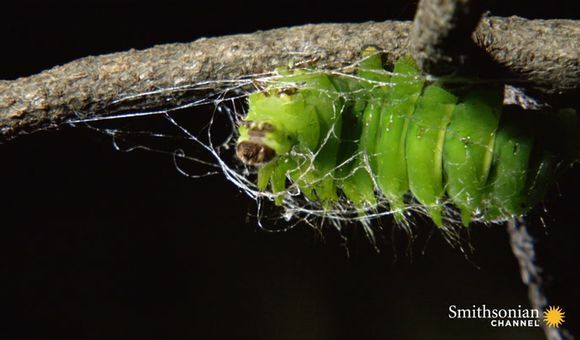 Perched in shallow niches are three mossy nests, each no bigger than a teacup. In the highest nest, they see the top of a gray, feathered head. Torretta swings his net toward the wall, as if forehanding a tennis ball. A bird flutters into its narrow end. 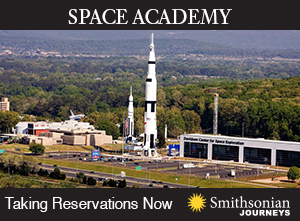 It’s not the female swift Beason is looking for, but an adult male—possibly her mate. 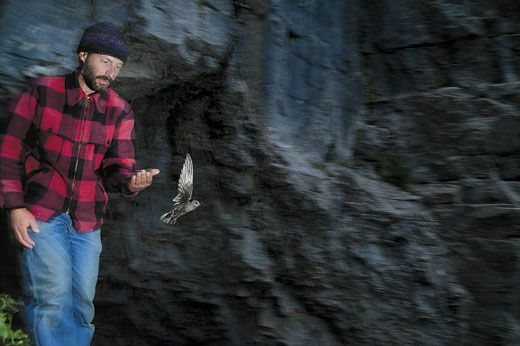 Beason holds the bird gently as he inspects it, stretching out its long, tapered wings to measure their span. The bird looks out from under the fringes of gray feathers above its eyes, alert but still. Beason massages its throat, feeling the glob of insects it has collected to feed its solitary chick. Swifts lay just one egg per season, and both parents share in the onerous care and feeding duties; swift chicks don’t leave their nests until they are around 6 weeks old, later than the chicks of similarly sized birds. 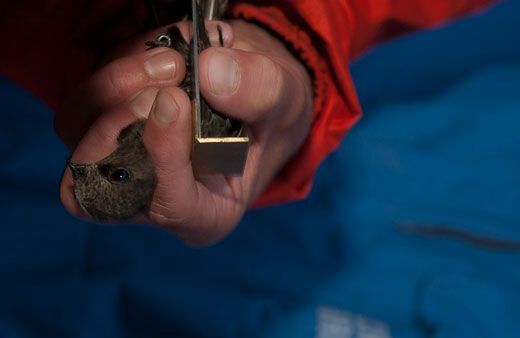 With pliers, Beason attaches an aluminum identification band to one of the bird’s legs, and sets the animal free. It flaps quickly back up to its nest, where a brand-new chick, naked but for a few bristly feathers, is waiting for a meal. Beason and Torretta are happy to have seen and banded a new bird, but they’re still thinking about the geolocator. Is the female close by, about to fly in for the evening? Beason, Torretta and Hurtado climb out of the cave and settle on a rock landing to wait, and Hurtado starts to reminisce about his lifetime of hikes in the canyon. As the stars begin to come out, the trio clambers back to the edge of the falls for a second try. 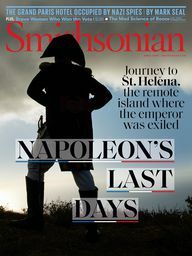 Kennerly was the first in a long line of naturalists to be intrigued—and baffled—by the black swift. 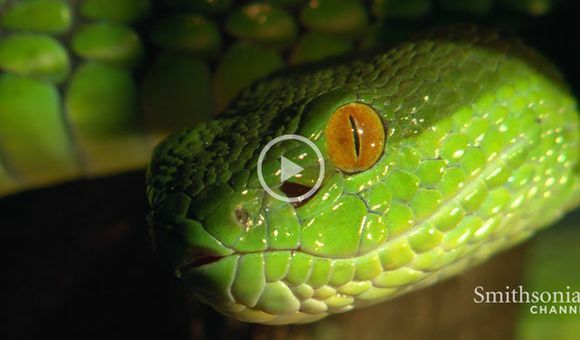 In the early 1900s, a handful of adventurous men and women found swift nests behind mountain waterfalls and in sea-sprayed caves on the California coast. In the 1940s, a college student named Owen Knorr began the first organized pursuit of the black swift. He scrambled up wet, mossy cliffs in the mountains of Colorado, balanced on slippery ledges and even rappelled into alpine waterfalls at night, banding birds as he dangled in the darkness from a climbing rope. He eventually identified more than 25 nesting sites throughout Colorado and reported nests in Utah, Arizona and New Mexico. For the next half-century, ornithologists made sporadic efforts to learn more about black swifts, but no one chased the birds as Knorr had. In the mid-1980s, a devoted birder named Rich Levad tracked down Knorr’s reports. 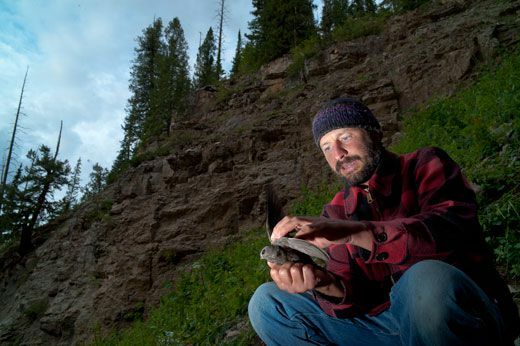 When Levad retired from his high-school teaching job, he went to work for the Rocky Mountain Bird Observatory and used Knorr’s records to search for swifts. 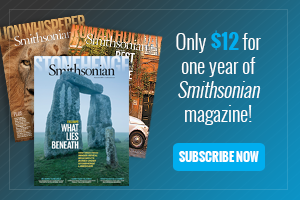 On a trip with a Forest Service technician, he peered over the rock rim of a 60-foot waterfall, fighting vertigo, and saw a nearly full-grown black swift chick on a nest, sheltered beneath a rocky overhang. Levad was hooked. He helped organize a new round of black swift surveys in Colorado, inspiring professionals and volunteers, and wrote The Coolest Bird, a book about black swifts and their generations of human fans. 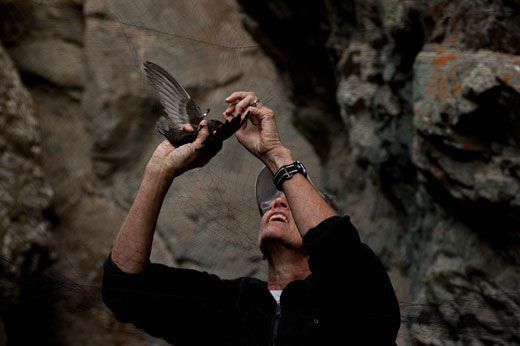 In recent years, Colorado birders have documented that all but one of Knorr’s original sites are still occupied by black swifts, and they have discovered 70 new nesting sites. In 2001, Beason located 13 new sites in the San Juan Mountains, beating Knorr’s record for the most sites found in a single summer.